On a triangular pennant per fess Azure and Argent, the club badge [a circular field with bordure Or per fess Azure and Argent a propeller and two water-skis Or]. Registered at the Bureau of Heraldry on 15 January 1965. The Cruising Association of South Africa (CASA) was located in Cape Town. Its burgee was a pennant 1:2 with a green field superimposed with yellow St. George's cross centred 1 unit from hoist. In 1999 the CASA merged with the South African Yacht Racing Association (SAYRA) to form South African Sailing (SAS). Founded in 1947 in East London, Eastern Cape. The burgee of the False Bay Yacht Club located in Simonstown is shown and described on its website and is "a white triangular pennant with a royal blue border on the upper and lower sides, and a black fouled anchor on the white ground next to the staff". It was registered under the Protection of Names, Uniforms & Badges Act of 1935 on 20 January 1961. Glenwood High School is located in Durban, KwaZulu-Natal. After the Anglo-Boer War, Dr. Sam Campbell, a well-known medical doctor, was greatly concerned at the poor outlook for boys who had left primary schools and lacked opportunities for further education and employment. After great effort, he was able to establish an institution for technical and higher education in Durban. Evening classes began at the Durban Technical Institute in September 1907. Later it was decided to start day classes and so it came to pass that on 01 August 1910 a high school was opened under the name of ‘The Day Continuation School for Boys” which eventually developed into the present day Glenwood High School. The name was changed to the “Technical High School, Durban” in 1915 and in 1934 the current name “Glenwood High School” came to be used. The present school badge (shown below) was designed in 1937. The green in the badge has now become synonymous with the School and its sports teams. The Glenwood High School Yacht Club was established in 1910. The Club burgee is a pennant (7:10) with a field divided quarterly gold (canton) and red (upper fly) charged with a green St. George’s Cross (0.5 units wide). The Canton is charged with the school’s badge on a white square (not shown on image). The burgee of the George Lakes Yacht Club in George (Western Cape) is shown on their website is divided per fess, white over blue. Imperial Yacht Club in Cape Town has burgee divided per pale green and red, in the hoist a white anchor as shown on its website. Image from this site. Founded in 1951 and resident at Rooikrantz dam from 1957 until 1992, the club is currently situated at Wriggleswade dam, on the Kubusie river, downstream of Stutterheim in the Eastern Cape. Burgee horizontally divided red-blue-red with all fields of the flag fimbriated in yellow, and yacht club acronym KWTYC, in yellow, placed horizontally in the blue stripe. Image from this website. Red burgee with a white K enclosed into a white lifebelt, linked to the three angles of the burgee with white stripes. KYC was founded in 1910. Located in Knysna, Western Cape. Image from this website. Lake Deneys Yacht Club, in Deneysville, on the banks of the Vaal Dam (Gauteng). Granted 15 Oct 1985. Located in Western Cape. Description: On a blue burgee edged white, a flamingo contourne volant proper. Milnerton Aquatic Club in Cape Town has a green burgee displaying a stylised white pelican as shown on its website. Image from this site, founded in 1956. Located in Mosssel Bay, Western Cape. Mossel Bay Yacht and Boat Club Club / Mosselbaai Seiljag en Boot Klub. Blue burgee with a white Southern Cross. 3.1. The Club Flag shall be a triangular pennant with the fly to be 1* times as long as the hoist with Southern Cross consisting of four pentagon stars and one smaller star in white set on a blue background: an example of which shall be retained with the Club records for reference and as registered with the Bureau of Heraldry. 3.2. The Club tie shall consist of a blue tie with the Club burgee with a white margin and partial flag pole embroidered on it:. In the case of club colours it shall have a gold margin: an example of which shall be retained with the Club records for reference. The club burgee shall be a red pennant with a white cross with a white lighthouse in the upper canton next to the staff Source: SAVA Journal 3/94: The Union Jack over Southern and Central Africa, 1795 - 1994 [brl94] by FG Brownell). This Club also has a flag and privileged ensign which are described and shown here. Image from this site, reported by Jarig Bakker, 23 Jan 2002. Burgee is horizontally divided dark blue-light blue with the silhouette of a sailboat in white shifted to the hoist. Located in Port Elizabeth (Eastern Cape). The Royal Cape Yacht Club Burgee is triangular, per pale red and blue, charged on the red with a white anchor ensigned with a Tudor Crown proper. The burgee has a narrow border around the edges. The image attached shows a yellow anchor and crown, shouldn't it be a white anchor with a full color crown? I caught Fred's comments to the contrary as well after I had drawn the image. However, according to RCYC officials, my rendition is correct. It is on their website and they verified my actual drawing. It might be worth looking into to see if the burgee did in fact look like Fred's description in the past. Image from this site, reported by Franc van Diest, 26 Jan 2002. The RNYC is the oldest of all the sport clubs in South Africa and the oldest yacht club in Southern Hemisphere. It was founded in May 1858 as the Durban Regatta Club and its name was later changed to Natal Yacht Club. In 1891, the club received a Royal Charter as Royal Natal Yacht Club. The club burgee is a 3:5 triangular flag with a Scandinavian cross blue-red-blue and a royal crown in canton. The crown on my image should be credited to Tod Mills. Located in Durban, KwaZulu-Natal. 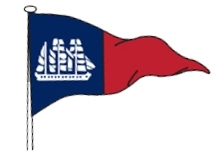 The burgee of the Saldanha Bay Yacht Club is divided per pale into blue and red, on the blue a three-masted sailing ship in white as shown on its website. Association (IRSA). Club, Regional and National competitions are held regularly at various venues around South Africa with international events taking place around the globe. Affiliated clubs are located in Johannesburg, Pretoria, Durban, Pietermaritzburg, Port Elizabeth, Cape Town, Bloemfontein and along the Garden Route in the Western Cape Province. SARSA has a pennant (circa 1:2) which is shown on its website, has the same design and colours as found in the South African national flag except the arms of the pall are closer together allowing the red, white, and blue areas to touch the hoist. The horizontal section of the pall is charged with the white capital letters SARSA. The burgee of the South African Yacht Racing Association (SAYRA) was a pennant 3:4 with a green field on which was superimposed a yellow Springbok's head surrounded by a yellow rope tied with a reef knot at top and centred 1/2 unit from hoist. SAYRA merged with the Cruising Association of South Africa in 1999 to form South African Sailing. This burgee was registered with the Bureau of Heraldry with Certificate number H4/3/1/2578 issued on 27 July 1989. The SAYRA also had an ensign, being a rectangular dark green flag charged with a St George's cross, the arms being one-tenth the width of the flag, and containing in the canton a Springbok's head surrounded by a yellow rope tied with a reef knot at the top. The ensign was registered at the Bureau of Heraldry with Certificate Number 2069 issued on 27 July 1989. The University of Cape Town Yacht Club has a burgee divided per fess into light blue and dark blue with a white anchor in the hoist. The University of KwaZulu-Natal (UKZN) is a university with five campuses in the province of KwaZulu-Natal. It was formed on 01 January 2004 after the merger between the University of Natal and the University of Durban-Westville. The University of KwaZulu-Natal Yacht Club Burgee is a pennant (3:5 with a light blue field charged with an adaption of the university's logo in black where the globe has been replaced with a black silhouetted of a sailboat with main and spinnaker (facing fly), and the black capital letters UKNZYC horizontally towards the fly point. The burgee of the Vogelvlei Yacht Club is described in their constitution as "a gold-bordered green pennant with a black goose flying away from the hoist" and is shown on its website. The burgee of the Worcester Yacht Club is blue, with three white flying geese flying away from the hoist, parallel to the lower edge and is shown on its website. Arthur Radburn, 28 Feb 2013. The burgee of the Zeekoevlei Yacht Club in Cape Town is shown on its website and is divided per fess into old gold and black, in the hoist a white anchor. The Zululand Yacht Club in 1960 in Richards Bay in KwaZulu-Natal. It's burgee as shown on its website is Per saltire, black hoist quarter charged with a white silhouette of a pelican (facing hoist), blue fly quarter, yellow upper quarter, and red lower quarter. SAVA Journal SJ: 6/97 (December 1997) entitled "The Burgees of Recreational Boating in South Africa - a preliminary checklist" [edr97] provides a detailed overview, with images, of yacht club burgees in South Africa (Ed).